Praeconium Circi Barnum et Bailey, "Maximi Orbis Terrarum Spectaculi," anno 1900 editum. 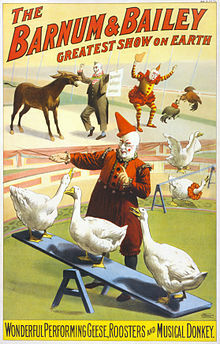 Circus hodiernus est grex spectaculorum artificium, in quo numero possunt esse scurrae, petauristae, saltatores trapezii et trochorum, funambuli, praestigiatores, unirotistae, aliique actores. Pater circi hodierni creditur esse Philippus Astley, qui circum anno 1768 in Anglia administrabat. Assael, Brenda. 2005. Circus and Victorian Society. Charlottesvilla Virginiae: University of Virginia Press. ISBN 0-8139-2340-9. Croft-Cooke, Rupert, et Peter Cotes. 1976. Circus: A World History. Londinii: Elek. ISBN 0-236-40051-7. Johnson, William M. 1990. The Rose-Tinted Menagerie. Iridescent Publishing. Nance, Susan. 2013. Entertaining Elephants: Animal Agency and the Business of the American Circus. Baltimorae: Johns Hopkins University Press. Speaight, George. 1980. A History of the Circus. Londinii: The Tantivy Press. ISBN 0-498-02470-9. Stoddart, Helen. 2000. Rings of Desire: Circus History and Representation. Mancuniae: Manchester University Press. ISBN 0-7190-5234-3. Novissima mutatio die 28 Iunii 2017 hora 12:47 facta.